We’ve been canning our beers for quite awhile now, and we love how easy it is to transport your favorite New Planet beers from adventure to adventure. But sometimes, it’s great cracking open a beer from the comfort of your own home, too. When that’s the case, it’s nice pouring your beer into a glass and savoring the coloring and aroma the beers have to offer. Did you know, though, that the glassware you’re using for your beer makes a difference? Here are a few choice types of glassware to use, depending on the style of beer you’re enjoying at any given time. The American pint glass (also called the Shaker). You know the one. Clocking in at 16 ounces and found at nearly every drinking establishment ever made, this is the go-to American beer-drinking glass. Bars love it because they’re cheap to buy, easy to clean, and they store easily. Their larger cousin—the 20 ounce English Imperial pint glass—is also quite common, and is typically used to serve English ales, lagers, and stouts. The Shaker pint glass is also great because of the variety of beers that work well in them. Nearly every type of ale or lager works well in these glasses. The open mouth allows for just enough head to be poured, either from a tap or from your New Planet can. The snifter is a great piece of glassware to add to your beer-drinking collection if you don’t already have a few. With a short stem and wide bowl, this glass is ideal for beers that have strong, potent aromas. The wide bowl allows the beer to breath, and the tapered mouth captures the nose of your beer as you bring it to your lips. Not only does the wide bowl allow the beer to breathe, but it also allows ample room to swirl your drink, so you can inhale all of the hoppy or wild aromas your beers have to offer. Curvy and beautiful, the weizen glass is ideal for wheat beers, though it’s also great for pilsners (if you don’t have a pilsner glass nearby, of course). And since we’re in the business of crafting delicious gluten-free and gluten-reduced beers, we take advantage of this beautiful glass for our other styles instead of wheat beers. Its elegant shape has a sturdy base that is narrower than a pint glass and the overall shape is typically taller, too. Like the snifter, the inward-curving top is well-served for trapping the aroma, as well as vibrantly displaying the beer’s head. Of course, you don’t have to have the “right” glass for your beer. Some glasses enhance the natural flavors, aromas, and appearance of your favorite libations, but you don’t need the proper glassware to enjoy a cold one. But there is something to be said for pouring your favorite New Planet beer into a crystal-clear glass, holding it up to the sunlight to admire its coloring, lifting it up to your nose to get a whiff of that hoppy goodness, and raising the glass to your lips for that first (and last) sip. 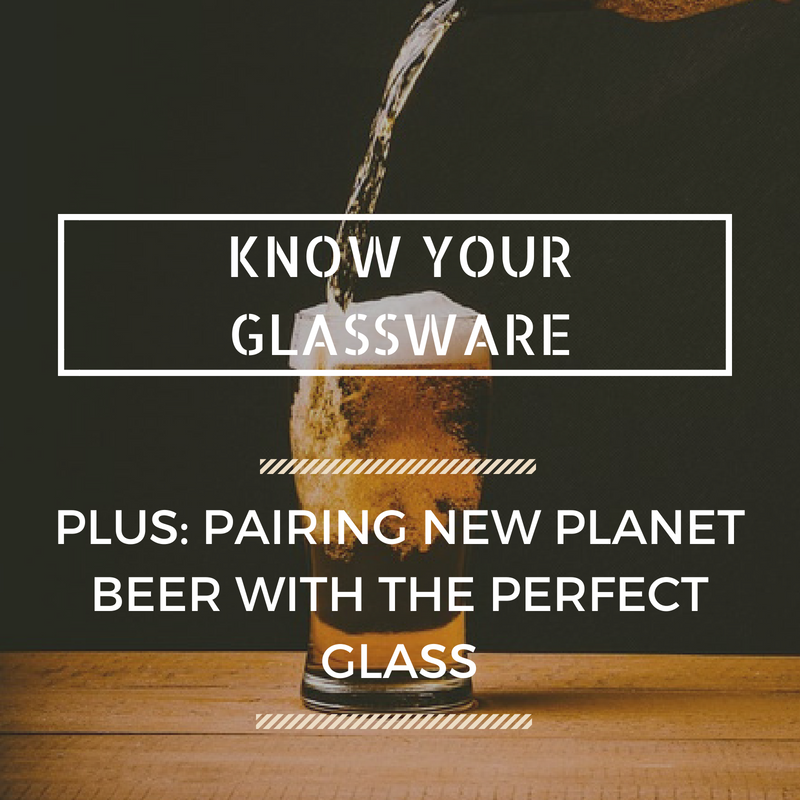 Can or glass, we hope you enjoy New Planet Beer however it works best for you!